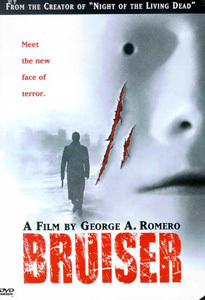 Bruiser is a tense, well-written movie as Romero brings his skill to bear and turns out his usual brand of intelligent horror. Henry is a doormat, his grasping gold-digger wife has no respect for him, his overbearing boss treats him like an idiot, his best friend is secretly betraying him and even his maid regularly steals from his home. Revenge is the dish of the day and Henry embarks on a veritable feast of bloody vengeance. It is more of a psychological thriller than a horror film and it certainly isn't Romero's best work but it is enjoyable and easily better than the majority of releases.